Videocart-2 is a collection of two games based around the shooting genre. First up is Desert Fox which is the precursor to Combat (1977, Atari 2600). 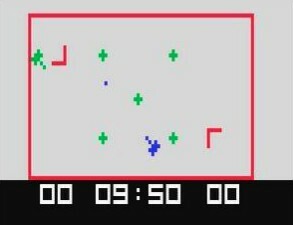 It's multiplayer only and the aim is move your tank around the battlefield barriers and shoot your opponent; the winner is the player who scores the most points within the allotted time limit. Accidentally touching one of the five mines scattered around the screen affords your opponent one point so careful manoeuvring is required. The gameplay really shows off the strengths of the Fairchild controller, as you can simultaneously steer your tank while twisting the paddle to aim shots. It works brilliantly, and even though it only allows for 45° increments, being able to strafe in 1976 is seriously impressive! The game's competitive nature makes for some laugh-out-loud matches and the barriers add a good wrinkle to the gameplay, as you sometimes need to put yourself in danger to advance position. The only downside is the slightly dodgy collision detection around these barriers. Next up is Shooting Gallery where your objective is to fire balls from your stationary rifle and hit moving targets. The rifle is repositioned after each hit and you frequently have to use the walls to ricochet shots towards the target. Each game is timed (from 2-20 minutes) and your final score is displayed when the clock hits zero. For what is essentially a very basic game it's tons of fun due to the skill, precision and quick-second reactions it requires. This is especially true in the turn-based multiplayer mode as you race against the clock to rack up a high score. However, this is exactly the same game that appeared on Videocart-1 (1976, Fairchild Channel F) and it really has no business being here again. Videocart-2 contains two excellent games with Arcade-style action, tight controls and superb multiplayer capabilities. It loses marks though due to the unnecessary rehash of Shooting Gallery, which, despite being a joy to play, has no new modes or gameplay mechanics to justify its inclusion on the first two Fairchild Channel F cartridges. Random trivia: To further add to the Shooting Gallery anomaly, the first two Videocarts were released simultaneously in North America on December 31, 1976.